It's finally happening! On the heels of our very successful reading at the legendary Neptune Theatre in the summer of 2017 attended by over 500, Don't Call it a Riot! will get a full production opening on Friday, May 11th, with a preview on Thursday May 10th for eight performances at 18th & Union Theatre in Seattle's Central District. Look for our Kickstarter campaign launching soon! Parley Playwrights presents: When a Tree Falls, a staged of a new play by ... ME!! Tuesday, February 13, 2018, 7 p.m., 18th Avenue & Union: an Arts Space. Tickets, $10. Rocky Styles has a lot to carry on her 17-year-old shoulders. Already she has dropped out of high school to take care of her ailing mother. Now she is selling off the furniture to stave off their imminent eviction. But when a stranger appears, it just may change Rocky's family forever. Starring Imani Woodley, Rachel Glass, Anjelica McMillan, Zoe Wolf, Alice Bridgforth and Terry Boyd! OMG! I had a blast in the role of Nancy in this hilarious and scathing black comedy, 63 Trillion. Reviewer Nancy Worssam called it: " ... a witty, wonderful, wildly funny play ... a marvelous cast ... brilliantly funny dialogue." Reading of Don't Call it a Riot! a Rousing Success! Hundreds showed up for the reading of Don't Call it a Riot! at the Neptune Theatre on August 10th. Many, many thanks to those who came out to support the work, and to the wonderful cast, and director, Quiqui Martinez. Thanks to all the wonderful people at STG. Stay tuned for more info on the full production in May 2018! NIGHTS AT THE NEPTUNE, A PEOPLE'S THEATRE JOINT, AND DON'T CALL IT A RIOT! I am honored that a staged reading of my Play, Don't Call it a Riot! is included as part of the Nights at the Neptune series. The reading is August 10th, 8 p.m. Guest panel discussion on Activism Then and Now, to follow. STG Presents a staged reading of DON'T CALL IT A RIOT!, a new play by Amontaine Aurore, on August 10, 2017 as part of STG's free Nights at the Neptune series! There will be a 30 minute post-show discussion. It is 1968, and Reed, a member of Seattle’s Black Panther Party must juggle the demands of a new marriage and being six months pregnant, yet still finds time to fight for liberation and dream of creating a better world. When her best friend, Marti, moves in, there is yet one more thing on her plate. Reed has no clue of the forces at work that will eventually destroy the Party, nor the ones that threaten her own happy home. It will take twenty-nine years before she will finally discover the betrayal that was at the root of a dream deferred. Amontaine Aurore is a writer, actor and performance artist who has lived and/or studied in Los Angeles, New York, Bali, Egypt, and Italy, and is presently living in Seattle. She is the author of eight plays, including FREE DESIREE, which is published by Indie Theater Now, and DON’T CALL IT A RIOT! Her plays have been presented at the United Solo Theatre Festival, the New York Fringe Festival, the Edinburgh Fringe Festival, 59E59 Theatre, On the Boards, West of Lenin, the Orcas Center, Theatre Battery, the Thelma Dewitty Theatre, and New City Theatre, among others. Amontaine is the recipient of several artist grants from the National Endowment of the Arts, Artist Trust, Seattle Office of Arts and Culture, 4Culture, and the Puffin Foundation. Amontaine is a proud member of Parley Playwright’s Group, and has twice been a writer-in-residence at the Hedgebrook Writers’ Retreat for Women. Her play, DON’T CALL IT A RIOT! was a finalist in the 2017 Bay Area Playwright’s Festival. DON'T CALL IT A RIOT! 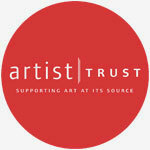 created with support from Artist Trust’s GAP Award. Here is a nice article from the Seattle Times about the series on its 5th Anniversary. Nights at the Neptune Celebrates Fifth Anniversary with Six Social Justice Programs, by Dusty Somers. I am thrilled to announce that my play, Don't Call it a Riot! was a finalist in the 2017 Bay Area Playwrights' Festival! Here is the announcement and full list of winning plays and playwrights! Parley is thrilled that the radiant Amontaine Aurore has joined our ranks! Welcome, Amontaine! Amontaine is a writer, actor and performance artist. She is the author of eight plays. Her plays have been produced throughout Washington, as well as nationally and abroad. 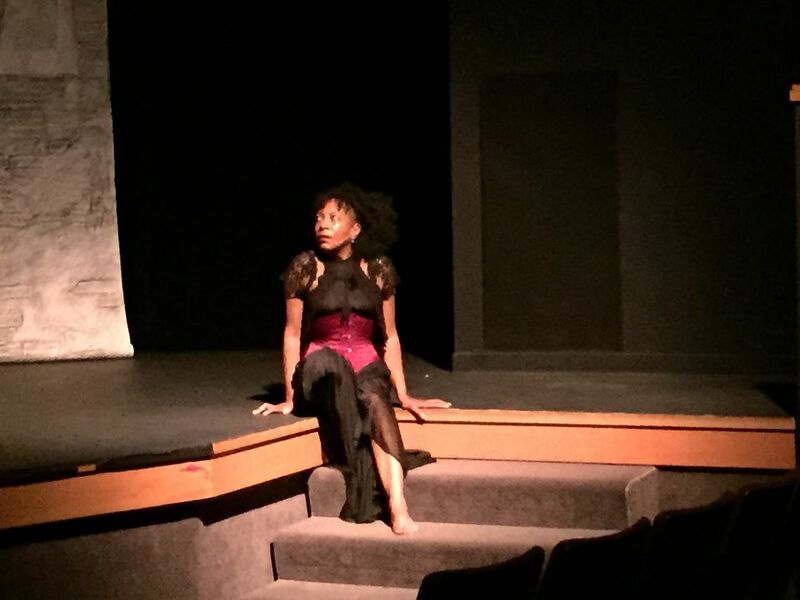 Her solo play, Free Desiree, has been produced in various venues throughout Seattle, as well as at the New York Fringe Festival, where it was named a Fringe Best Bet, and included among the collection of Best New Plays in the 2013 New York Fringe by Indie Theater Now. 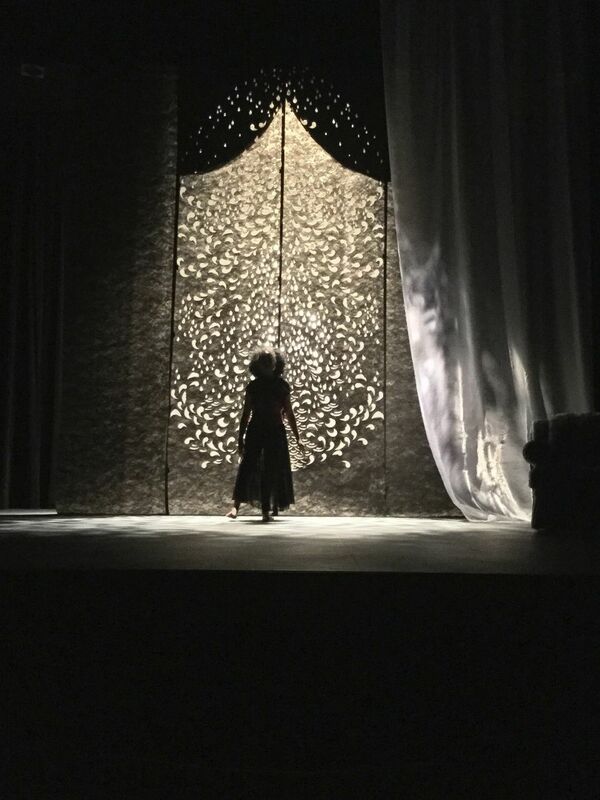 Amontaine’s newest solo play, Love Letters Beyond the Veil, premiered at the Orcas Center Mainstage on Orcas Island, and made its New York debut in November 2016 at the United Solo Theatre Festival. In the summer of 2016, her play, Don’t Call it a Riot! was chosen to receive a workshop and public reading from Theatre Battery in Kent, Washington. Don’t Call it a Riot! will have another public reading in August 2017 at the Neptune Theatre for the Nights at the Neptune Series, and will have a full production at 18th and Union Theatre in January 2018. Amontaine is the recipient of several artist grants from Artist Trust, Seattle Office of Arts and Culture, 4Culture, and the Puffin Foundation. She has been a writer-in-residence at the Hedgebrook Writers’ Retreat on Whidbey Island. Watch the promo video and get a sneak peak! I felt so honored this past weekend to be included as a panelist in the Black Woman WIsdom Summit with some of the flyest playwrights in the country. These women are brilliant, articulate, and take no prisoners when it comes to speaking their minds. Here is an article from the Seattle Weekly on the event. Here is a recent interview I did with Encore Magazine. Enjoy! Yippee Yi Yay! My solo show, Love Letters Beyond the Veil has been accepted into New York's United Solo Theatre Festival. United Solo is the world’s largest solo theatre festival, currently in its 7th season. All shows are staged at Theatre Row: 410 West 42nd Street, New York City. Use the link below to access details about Love Letters at United Solo. Thank you! We're pleased to announce our selections for this season's BATTERY POWERED series! There were a number of excellent submissions this year, and somehow we managed to narrow it down to these 3 plays that will be workshopped and presented as staged readings. Stay tuned for performance info, and we'll see you there! DON'T CALL IT A RIOT! 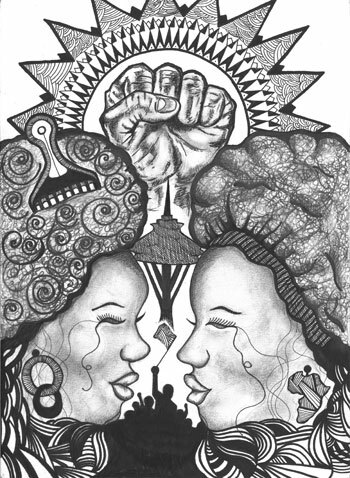 by Amontaine Aurore (right): Three members of Seattle’s Black Panther Party in the 1960s fight for liberation and dream of creating a better world. But as forces conspire to destroy the movement, and as their paths veer in wildly different directions, each will come to pay the price for a dream deferred. A QUALITY EDUCATION by Seayoung Yim (center): In an elite private school, students and staff of contrasting backgrounds must each navigate their places of power... and the starting line is not the same for everyone. 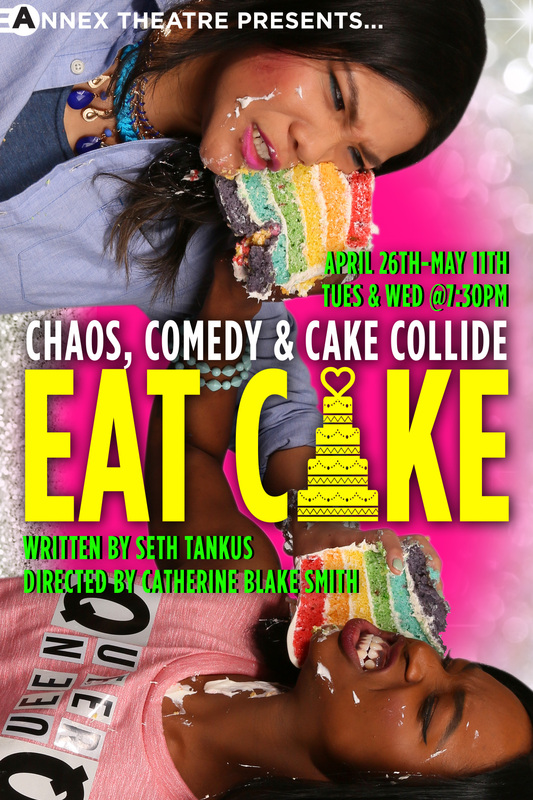 I am excited to be playing the role of Petra in Annex Theater's production of Eat Cake, written by Seth Tankus, directed by Catherine Blake Smith. Opening soon! Tuesdays and Wednesdays, April 26th - May 11th. This show is hella fun! Come join the party and Eat Cake! I am pleased to announce that I am starring in the short art film, Avatar: Fanon and Decca, written and performed by this year's Stranger Genius Award Winner, C. Davida Ingram. It is part of the Genius Exhibit at the Frye Art Museum, from September 26, 2015 to January 10, 2016. I play the dual roles of Fanon Brown and Decca Jones. Below is the link to an article in Vanguard Magazine regarding the exhibit. The World Premiere of Love Letters Beyond the Veil was a rousing success! My heartfelt thanks to the artists who collaborated on this show and gave so generously of their time, energy and passion, and to the Orcas Center for giving me the opportunity to bring this story to the stage. Click below to read the review by Norm Stamper. I am thrilled to announce that I will be part of Radial Theater Project's Locally Grown, a new festival of original performance by local artists. FAMILY AFFAIR - CABARET SERVED UP FAMILY STYLE! I will be performing at the Rendezvous Seattle as a part of Family Affair -Cabaret Served up Family Style, on Wednesday, January 21st at 7:30 p.m. Also on the bill is musical guest Diamondwolf, Paul Shipp, Christi Cruz and Emmett Montgomery. Should be loads of fun!